On Sale Now! Free Shipping Included! 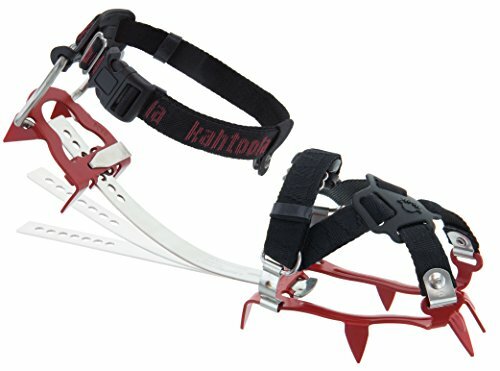 Save 6% on the Kahtoola KTS Steel Hiking Crampons with SRS (S/M) by Kahtoola at Social Seeker. MPN: KTS17. Hurry! Limited time offer. Offer valid only while supplies last. Need a hiking crampon that's going to answer to your demands? Our KTS Steel Hiking Crampons are made from chromoly steel with 1 inch points. Need a hiking crampon that's going to answer to your demands? Our KTS Steel Hiking Crampons are made from chromoly steel with 1 inch points. Ultralight and weighing only 23.3 ounces per pair, you'll be able to tackle the most rugged terrain without any extra weight to haul around. The KTS steel hiking crampons fold down into an ultra compact package (8" x 3½" x 4¾") to save pack space, leaving plenty of room in your pack for all the necessities your winter adventures demand. Now includes Snow Release Skins (SRS)! Be sure to check out the Kahtoola Crampon Tote Sack to complement your crampons. Flexible, ultralight, packable hiking crampons for more rugged conditions. Now includes Snow Release Skins (SRS)! 3 Year Warranty. Lifetime Warranty on LeafSpring Extender Bar. Shoes not included. If you have any questions about this product by Kahtoola, contact us by completing and submitting the form below. If you are looking for a specif part number, please include it with your message.